**DANCING ELEPHANT HOSTEL** was the very FIRST hostel, eight years ago to hit Haad Rin, the home of the monthly Full Moon Party!!! Located in the heart of the famous Full Moon Village, a bustling, multi-cultural party spot, we are surrounded by beautiful beaches and people. 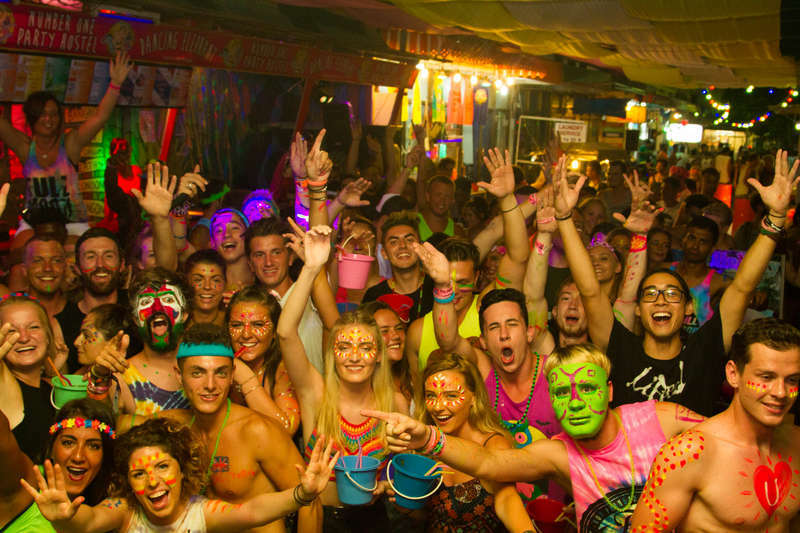 Only a 1 minute jog from the actual Full Moon Party, putting you in the best location possible! 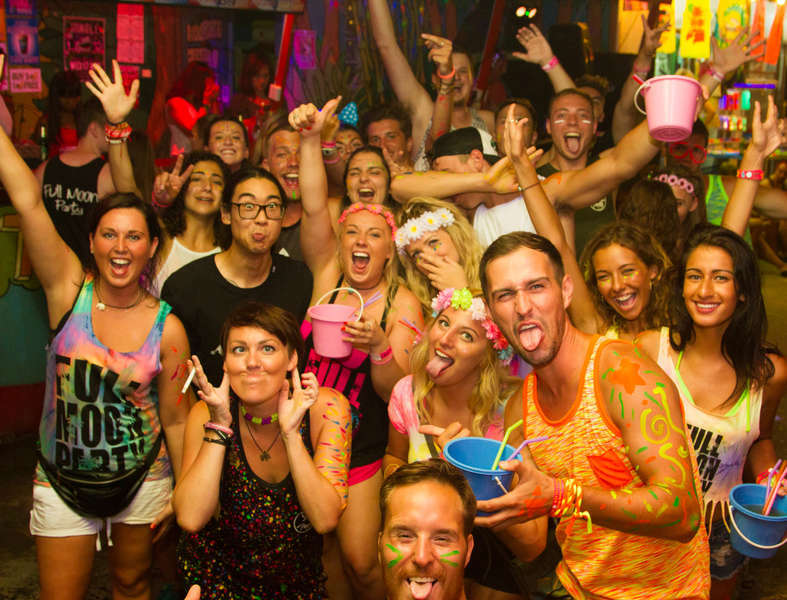 We HIGHLY RECOMMEND that you arrive four nights before the Full Moon Party! Here it is a FESTIVAL, there are parties every night leading up to the Full Moon. Some say that these parties are even better than the Full Moon itself! 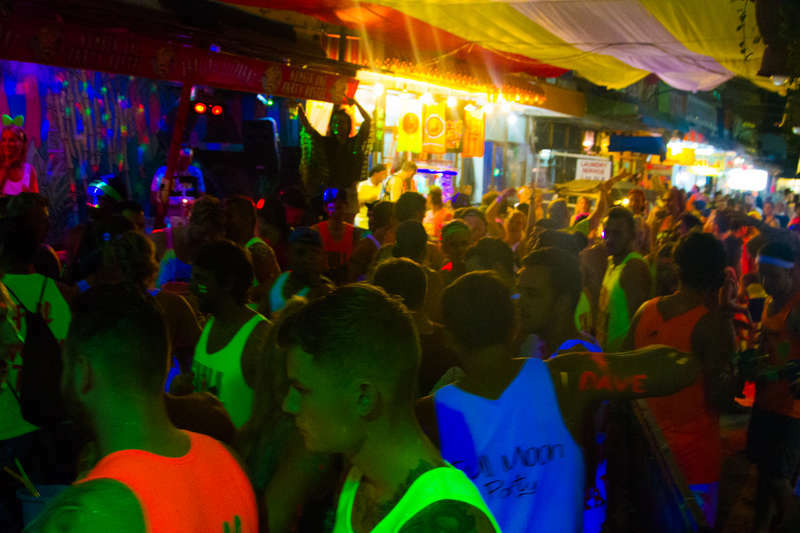 AVOID checking out the night after the Full Moon Party, as it goes all the way until sunrise, and followed by an amazing AFTER PARTY. There’s no strangers here, only friends you haven’t met yet. During Full Moon week we are the unique. the ORIGINAL, the crazy ‘Street Party’, the ONE that makes us what we are today. Hundreds of party people from all countries, dancing to live sets by international guest DJ’s. We provide a clean and safe hostel, with vibrant character and colorful charm. Regardless of whether or not you’re traveling solo or in a group, you’ll be calling this home straight away. FROM THONGSALA PIER: After arriving in Thongsala pier you will take a short walk to the taxis. Let the taxi drivers that you are staying at DANCING ELEPHANT in HAAD RIN. The drivers will advise you which taxi to jump into, and you should be paying no more than 100 THB per person. If you opt to take a taxi motorbike, you’ll be paying closer to 200 THB. The taxis will be dropping people off at different locations around Haad Rin, so it will take approximately 25-30 minutes to arrive. • New Year Period, 5000 THB per person. Full Refund of the prepayment you paid to us, up to 14 days before arrival. - In case of no show or late arrival the deeposit is lost. No food or drink (water is ok) allowed in the dorms.